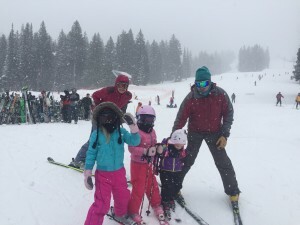 Friday is “ski with the grandchildren day” in my family. We go up for the afternoon and practice our turns on the intermediate runs. The seven-year-old is working on parallel turns, while the four-year-old, who started out turning very gradual parallel turns has spontaneously adopted a snowplow turn style. Emma, the younger, was delighted one day when she found a nickel and a penny in the old Suburban we use for our ski car. So last Friday, I left a quarter for her on the console and sure enough, she found it. “Look, grandpa, a nickel.” I told her it was actually a quarter, with a value of five nickels, and she should take it home and add it to her collection of found money. I have added to her security by leaving the quarter to be found. It is a good thing to be free to do as one wants, and not be coerced into things others believe are in your best interest. Now Emma doesn’t ask who lost the quarter. My cat doesn’t ask where cat food comes from. We go through life, finding quarters and never wondering whence they come. I choose to believe in God, and that is where I attribute their provenance. The advantage to me is a sense of security and relationship with my understanding of God. (Should I say, “my current misunderstanding of God”? Isn’t is certain that all our beliefs are tentative and misunderstandings? Isn’t it inevitable that my understanding will develop?) There are many benefits one accrues, including a sense of meaning and purpose. Rodney Stark at Baylor has shown that a belief in a personal God does give one more happiness, greater sense of meaning, and hope than either a belief in the distant, impersonal God of Spinoza and Einstein, or a will to disbelieve. The reader may have already figured out that I am alluding to William James’ great lecture, “The Will to Believe” which is available on the web. James was reacting to William Clifford’s essay, “The Ethics of Belief” published in 1877, two years before his untimely death. Clifford argued that it is immoral to believe anything for which one has no evidence. Specifically, he argued there was no evidence for Christianity and so it was sinful to believe. James argued that, to the contrary, it is impossible to proceed in life without belief, and that such belief propels one to work that, when it turns out well, ratifies the original belief. One can still see the echoes of Clifford today. I saw it recently. Eating lunch with an academic friend who is horrified at me being a believer, he cried, “But there is no evidence!” While the cry is heartfelt, it is wrong. Speak respectfully to any group of believers and you will find many instances of finding quarters in unexpected places. The believer finds abundant evidence in miracles large and small. A friend owned a motorcycle, and approaching an intersection with a green light, he felt a powerful compulsion to stop. A small car whizzed through the red light with a young woman holding a cell phone in front of her. He attributed that to a divine prompting. He found a quarter. And while you may criticize a loving grandfather for salting likely locations with quarters, that same grandfather sees abundant evidence of a loving God who likewise drops hints and taps us on our shoulder. That grandfather justifies his actions based on a general delight in seeing his granddaughter’s delight. As below, so above. Can we not then imagine a God who simply delights in creating tender mercies for his children to stumble upon? Each of these spiritual quarters has an ambiguous quality. That is, life is like a Rorschach, that collection of inkblots that present an ambiguous stimulus and onto which we project our perceptions. We see the world, as the saying goes, not as it is, but as we are. So while my materialist friend says that it was a lucky coincidence to find that quarter, I see an invisible hand dropping it into my path. I find great confirmations from my will to believe, just as my skeptical atheist friend finds that when others tell him that there is no evidence, he believes that. Were I to explain my basis for belief, he would scoff and attribute randomness where I see purpose. James was a pragmatist, who argued that we know generally of truth because it works. He argued that mere prediction is not enough, that there is a general robustness to living a life enhanced by positive beliefs. Both James and Clifford did important work that is still of great value today. Clifford was reacting to his own time in which there was a vigorous debate between religion and science. James’ pragmatism has, in my eyes, a more timeless quality. What will you believe the next time you pick up a quarter? You get to choose. Thanks for your generous post, Lynn. I believe it was Oscar Wilde who said that all our human dilemmas are caused by the sloppy use of language, and the word “belief” is a beautiful example. The word derives from “lief” which also gave issue to “love” and means “to hold dear”, so “I believe” translates into “I hold this dear”. From this point, asking for evidence is irrelevant, incongruous, and lacks logic. What could the possible relevance of evidence about “I hold this dear”? Thanks for your post and sharing your willingness to believe without the nonsense of providing evidence. Nice…love hearing about your life, family, thinking/feeling…This one reminded me of Doug Marman’s new book, Lenses of Perception: a surprising new look at the origin of life, the laws of nature, and our universe. Thanks for all your blogs, work and life. Thanks for all your news letters. Thanks for this Lynn. Our field tends to be very secular so expressions like this are refreshing for those of us who feel there is much more than what the secular world view envisions (or allows?). Lynn — I thought it timely to file this post in response to your personal report about your faith. I am a PhD experimental psychology professor at a university with the traditional professional responsibilities of teaching, research and service. Despite my research history, I turned to reading positive psychology late in my career (taught the course several times before retiring) and stayed up-to-date on the literature, including keeping up with Martin’s listserv where I appreciated your posts very much especially while you were catching flack for your faith while also a psychologist. I am motivated in particular to respond to your post because within the past month I have been diagnosed with not only one but two cancers, acute leukemia the most worrisome. Well, while still stunned by the news I was inoculated by my faith throughout my life and therefore am not asking, “Why me!” My GP also counseled me against this reaction. “Rather, Why not me?” I remain grateful for the remarkably gifted life I and my wife have led together. I have not struggled either with the ambiguity of God’s Plans and the workings of His Kingdom — the disciples of His son also failed to understand. God is God. If He shared more with us would we understand? I have wondered why so many of our scientists cannot get past the ambiguity. They insist on setting conditions on any faith they might be able to generate which is irrational to me given that we do not choose to be born and when we die. Like we yearn to be in control when we are not. Atheists have turned from God because for example they cannot reconcile have lost a child — as if we own a child and resent what has come of it. I struggle with intolerance of ambiguity on the left that is normally attributed to the right. Another intolerance what is this about heaven — it should be boring, when we have no idea what heaven is like. In my new found state in life — I am looking for God prayerfully to tell me what do I do next? Rather than taking my short time remaining of quality of life — I have chosen to do battle with the disease. Any Comments? Otto points out that life is difficult and challenging, and he faces a double whammy that would knock the wind out of the most resilient. My heartfelt thanks for your wise and deep words, Otto, and my prayers are with you at this time of trial. Thanks for this Lynn – well said! Keep up the good work – you are appreciated! Thank you, I feel truly blessed and thankful as a professional and a human being to read your work and learn from your insights. Your blog post was inspiring and comforting. Thank you so much. is powerless for matters not pedagogic. Turned linear thinking into a sop. is the end all and be all, “Oh Glorious me”. And that we are the rulers of all we can see. Appreciate the wonderful poem. By the way, Lawrence is associated with Thought Technology, a leading biofeedback firm. I have found many quarters in my life’s journey. I truly believe. Thanks for sharing. Your thoughts, while not exactly my own, mirror those of my best friends, people whom I admire. It is a bold stance in these times and, as always, I appreciate your thoughts. Frankly, I am surprised by the absence of negative responses. A positive commentary perhaps, on your readership. A Baby Boomer myself, I appreciate and am inspired by your willingness to share on so personal a level. I had three opposing comments emailed directly to me, and not left on the page. The three comments were actually heart-warming in that they appreciated me sharing but don’t find the higher power a useful concept. Fine with me. As I said, there is a real Rorschach quality to these questions, and I find some things helpful that others do not. Dr. J, your post here catches me at a time in my life where I am actively and consciously trying to decide how to view the quarters I find in my life. Your post helps me affirm some of the ideas that were floating around in my mind lately. I’m really grateful you were willing to post on this topic. Also, thank you Rob Mcneilly for a great response below. In addition, @Otto Zinser your post was extremely touching and I thank you for sharing your story and your thoughts on going forward, it was inspiring. Thanks to all!